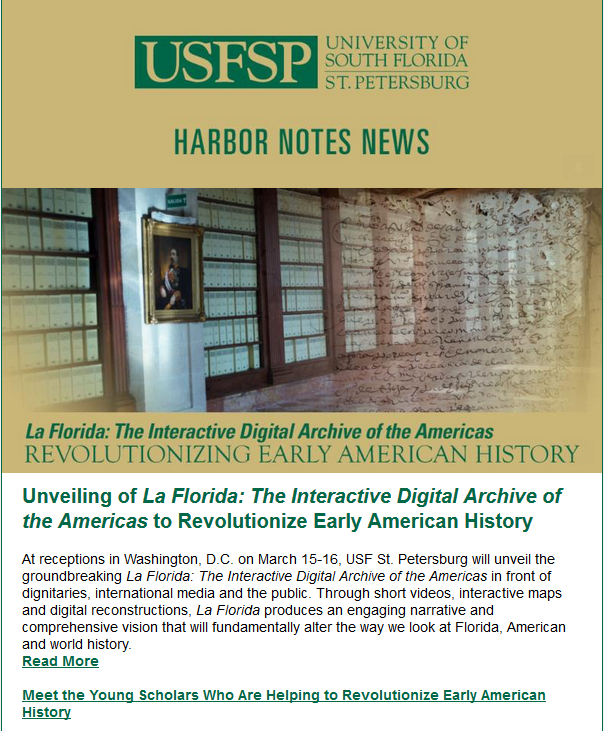 Harbor Notes is the e-newsletter publication from the University of South Florida St. Petersburg. Distributed to faculty and staff, community partners, alumni, donors and more, the publication highlights the many events, recent news, and achievements of the USF St. Petersburg community. Interested individuals may subscribe to receive it via email by signing up for it at the Email Newsletter link on this website: https://www.usfsp.edu/home/usfsp-news/. Harbor Notes : 2019 : 01, University of South Florida St. Petersburg. Office of University Advancement. Harbor Notes : 2018 : 12, University of South Florida St. Petersburg. Office of University Advancement. Harbor Notes : 2018 : 11, University of South Florida St. Petersburg. Office of University Advancement. Harbor Notes : 2018 : 10, University of South Florida St. Petersburg. Office of University Advancement. Harbor Notes : 2018 : 09, University of South Florida St. Petersburg. Office of University Advancement. Harbor Notes : 2018 : 08, University of South Florida St. Petersburg. Office of University Advancement. Harbor Notes : 2018 : 05, University of South Florida St. Petersburg. Office of University Advancement. Harbor Notes : 2018 : 04, University of South Florida St. Petersburg. Office of University Advancement. Harbor Notes : 2018 : 03, University of South Florida St. Petersburg. Office of University Advancement. Harbor Notes : 2018 : 02 : 19, University of South Florida St. Petersburg. Office of University Advancement. Harbor Notes : 2018 : 01 : 16, University of South Florida St. Petersburg. Office of University Advancement. Harbor Notes : 2017 : 12 : 06, University of South Florida St. Petersburg. Office of University Advancement. Harbor Notes : 2017 : 11 : 15, University of South Florida St. Petersburg. Office of University Advancement. Harbor Notes : 2017 : 10 : 31, University of South Florida St. Petersburg. Office of University Advancement. Harbor Notes : 2017 : 10 : 11, University of South Florida St. Petersburg. Office of University Advancement. Harbor Notes : 2017 : 09 : 21, University of South Florida St. Petersburg. Office of University Advancement. Harbor Notes : 2017 : 04 : 17, University of South Florida St. Petersburg. Office of University Advancement. Harbor Notes : 2017 : 01 : 13, University of South Florida St. Petersburg. Office of University Advancement. Harbor Notes : 2016 : 12 : 09, University of South Florida St. Petersburg. Office of University Advancement. Harbor Notes : 2016 : 11 : 18, University of South Florida St. Petersburg. Office of University Advancement. Harbor Notes : 2016 : 11 : 10, University of South Florida St. Petersburg. Office of University Advancement. Harbor Notes : 2016 : 10 : 21, University of South Florida St. Petersburg. Office of University Advancement. Harbor Notes : 2016 : 09 : 30, University of South Florida St. Petersburg. Office of University Advancement. Harbor Notes : 2016 : 09 : 09, University of South Florida St. Petersburg. Office of University Advancement. Harbor Notes : 2016 : 08 : 26, University of South Florida St. Petersburg. Office of University Advancement. Harbor Notes : 2016 : 05 : 06, University of South Florida St. Petersburg. Office of University Advancement. Harbor Notes : 2016 : 04 : 29, University of South Florida St. Petersburg. Office of University Advancement. Harbor Notes : 2016 : 04 : 15, University of South Florida St. Petersburg. Office of University Advancement. Harbor Notes : 2016 : 04 : 08, University of South Florida St. Petersburg. Office of University Advancement. Harbor Notes : 2016 : 04 : 01, University of South Florida St. Petersburg. Office of University Advancement. Harbor Notes : 2016 : 03 : 04, University of South Florida St. Petersburg. Office of University Advancement. Harbor Notes : 2016 : 02 : 05, University of South Florida St. Petersburg. Office of University Advancement. Harbor Notes : 2016 : 01 : 22, University of South Florida St. Petersburg. Office of University Advancement. Harbor Notes : 2015 : 12 : 04, University of South Florida St. Petersburg. Office of University Advancement. Harbor Notes : 2015 : 11 : 13, University of South Florida St. Petersburg. Office of University Advancement. Harbor Notes : 2015 : 10 : 16, University of South Florida St. Petersburg. Office of University Advancement. Harbor Notes : 2015 : 10 : 02, University of South Florida St. Petersburg. Office of University Advancement. Harbor Notes : 2015 : 09 : 04, University of South Florida St. Petersburg. Office of University Advancement. Harbor Notes : 2015 : 05 : 01, University of South Florida St. Petersburg. Office of University Advancement. Harbor Notes : 2015 : 04 : 24, University of South Florida St. Petersburg. Office of University Advancement. Harbor Notes : 2015 : 04 : 17, University of South Florida St. Petersburg. Office of University Advancement. Harbor Notes : 2015 : 04 : 10, University of South Florida St. Petersburg. Office of University Advancement. Harbor Notes : 2015 : 04 : 03, University of South Florida St. Petersburg. Office of University Advancement. Harbor Notes : 2015 : 03 : 27, University of South Florida St. Petersburg. Office of University Advancement. Harbor Notes : 2015 : 03 : 20, University of South Florida St. Petersburg. Office of University Advancement. Harbor Notes : 2015 : 03 : 13, University of South Florida St. Petersburg. Office of University Advancement. Harbor Notes : 2015 : 02 : 27, University of South Florida St. Petersburg. Office of University Advancement. Harbor Notes : 2015 : 02 : 20, University of South Florida St. Petersburg. Office of University Advancement. Harbor Notes : 2015 : 02 : 13, University of South Florida St. Petersburg. Office of University Advancement. Harbor Notes : 2015 : 02 : 06, University of South Florida St. Petersburg. Office of University Advancement. Harbor Notes : 2015 : 01 : 30, University of South Florida St. Petersburg. Office of University Advancement. Harbor Notes : 2015 : 01 : 23, University of South Florida St. Petersburg. Office of University Advancement. Harbor Notes : 2014 : 12 : 05, University of South Florida St. Petersburg. Office of University Advancement. Harbor Notes : 2014 : 11 : 21, University of South Florida St. Petersburg. Office of University Advancement. Harbor Notes : 2014 : 11 : 14, University of South Florida St. Petersburg. Office of University Advancement. Harbor Notes : 2014 : 11 : 07, University of South Florida St. Petersburg. Office of University Advancement. Harbor Notes : 2014 : 10 : 31, University of South Florida St. Petersburg. Office of University Advancement. Harbor Notes : 2014 : 10 : 24, University of South Florida St. Petersburg. Office of University Advancement. Harbor Notes : 2014 : 10 : 17, University of South Florida St. Petersburg. Office of University Advancement. Harbor Notes : 2014 : 10 : 10, University of South Florida St. Petersburg. Office of University Advancement. Harbor Notes : 2014 : 10 : 03, University of South Florida St. Petersburg. Office of University Advancement. Harbor Notes : 2014 : 09 : 26, University of South Florida St. Petersburg. Office of University Advancement. Harbor Notes : 2014 : 09 : 19, University of South Florida St. Petersburg. Office of University Advancement. Harbor Notes : 2014 : 09 : 12, University of South Florida St. Petersburg. Office of University Advancement. Harbor Notes : 2014 : 09 : 04, University of South Florida St. Petersburg. Office of University Advancement. Harbor Notes : 2014 : 07 : 24, University of South Florida St. Petersburg. Office of University Advancement. Harbor Notes : 2014 : 05 : 09, University of South Florida St. Petersburg. Office of University Advancement. Harbor Notes : 2014 : 04 : 24, University of South Florida St. Petersburg. Office of University Advancement. Harbor Notes : 2014 : 04 : 17, University of South Florida St. Petersburg. Office of University Advancement. Harbor Notes : 2014 : 04 : 11, University of South Florida St. Petersburg. Office of University Advancement. Harbor Notes : 2014 : 04 : 04, University of South Florida St. Petersburg. Office of University Advancement. Harbor Notes : 2014 : 03 : 21, University of South Florida St. Petersburg. Office of University Advancement. Harbor Notes : 2014 : 02 : 28, University of South Florida St. Petersburg. Office of University Advancement. Harbor Notes : 2014 : 02 : 21, University of South Florida St. Petersburg. Office of University Advancement. Harbor Notes : 2014 : 02 : 14, University of South Florida St. Petersburg. Office of University Advancement. Harbor Notes : 2014 : 02 : 07, University of South Florida St. Petersburg. Office of University Advancement. Harbor Notes : 2014 : 01 : 31, University of South Florida St. Petersburg. Office of University Advancement. Harbor Notes : 2014 : 01 : 24, University of South Florida St. Petersburg. Office of University Advancement. Harbor Notes : 2014 : 01 : 17, University of South Florida St. Petersburg. Office of University Advancement. Harbor Notes : 2014 : 01 : 10, University of South Florida St. Petersburg. Office of University Advancement. Harbor Notes : 2013 : 12 : 13, University of South Florida St. Petersburg. Office of University Advancement. Harbor Notes : 2013 : 12 : 06, University of South Florida St. Petersburg. Office of University Advancement. Harbor Notes : 2013 : 11 : 22, University of South Florida St. Petersburg. Office of University Advancement. Harbor Notes : 2013 : 11 : 15, University of South Florida St. Petersburg. Office of University Advancement. Harbor Notes : 2013 : 11 : 08, University of South Florida St. Petersburg. Office of University Advancement. Harbor Notes : 2013 : 11 : 01, University of South Florida St. Petersburg. Office of University Advancement. Harbor Notes : 2013 : 10 : 25, University of South Florida St. Petersburg. Office of University Advancement. Harbor Notes : 2013 : 10 : 18, University of South Florida St. Petersburg. Office of University Advancement. Harbor Notes : 2013 : 10 : 11, University of South Florida St. Petersburg. Office of University Advancement. Harbor Notes : 2013 : 10 : 04, University of South Florida St. Petersburg. Office of University Advancement. Harbor Notes : 2013 : 09 : 27, University of South Florida St. Petersburg. Office of University Advancement. Harbor Notes : 2013 : 09 : 20, University of South Florida St. Petersburg. Office of University Advancement. Harbor Notes : 2013 : 09 : 13, University of South Florida St. Petersburg. Office of University Advancement. Harbor Notes : 2013 : 09 : 06, University of South Florida St. Petersburg. Office of University Advancement. Harbor Notes : 2013 : 08 : 30, University of South Florida St. Petersburg. Office of University Advancement. Harbor Notes Plus : A Year in Review, 2012-2013, University of South Florida St. Petersburg. Office of University Advancement. Harbor Notes : 2013 : 05 : 10, University of South Florida St. Petersburg. Office of University Advancement. Harbor Notes : 2013 : 05 : 03, University of South Florida St. Petersburg. Office of University Advancement. Harbor Notes : 2013 : 04 : 26, University of South Florida St. Petersburg. Office of University Advancement. Harbor Notes : 2013 : 04 : 19, University of South Florida St. Petersburg. Office of University Advancement.